According to a new report by Punch newspaper, the Australia-returnee husband who reportedly got married with his wife who is an employee of Globacom Nigeria Limited, a few months ago at a court registry in Bayelsa State, confessed to the crime, adding that he had served various jail terms in Australia and was also involved as a witness or suspect in certain murder case. 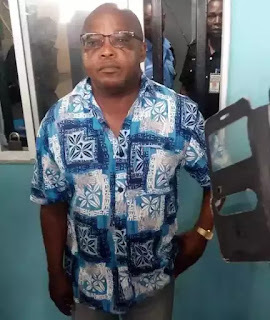 It was gathered that on August 16, the Delta state-born Akpata popularly called Bishop because he reportedly pastored a church, allegedly murdered his 33-year-old wife who worked with Glo in Yenagoa. The suspect, said to have spent over 27 years in Australia, allegedly strangled his new wife with the cords of a pressing iron before stabbing her to death with a knife. The incident was reportedly exposed when one of Onyinye’s colleagues at Glo, identified as Moses Awo, allegedly reported it at Ekeki Police Division in Yenagoa when the woman failed to report for work. Awo had reportedly told the police that when he and another colleague visited Onyinye’s house, located behind Fido Water Company in Kpansia area of Yenagoa, they discovered that the apartment was locked, while a television was on and broadcasting loudly. The authorities at Ekeki Police Divison reportedly detailed some policemen to the deceased’s house. They forced the door open, and found Onyinye lying dead in a pool of blood. Akpata, the prime suspect in the murder, was reportedly arrested by police in Badagry, Lagos State, after about two weeks after the discovery. Parading the suspect on Thursday at the state command’s headquarters, the Commissioner of Police in the state, Asuquo Amba, said his operatives discovered that Onyinye’s room was scattered and that she lay dead facing down in a pool of blood. Amba said the exhibits recovered at the scene of crime included a pair of knickers, a pair of canvas, shoes, one damaged pressing iron, a jeans jacket, a pen knife, a pink singlet, a Nokia phone and a damaged wristwatch, adding that the exhibits were stained with blood. Amba reported that the marks on Onyinye’s head, face, neck and body revealed that she was probably strangled and then stabbed with to death, adding that her remains had been deposited at the morgue of the Federal Medical Centre, Yenagoa, for autopsy. Explaining how Akpata was arrested, in Badagry on September 1 and brought to Bayelsa the same day, Amba said investigations revealed that the suspect absconded to Ghana after the murder, but returned to Badagry, Lagos State, a few days after. Amba added, “When we arrested him, we brought him here. After much interrogation, he agreed that he actually killed the lady. He said the lady (Onyinye) attacked him because of a certain text messages he saw on her phone. “He has been staying in Australia for a very long time. He claimed to be a Bishop; he mentioned some few churches. We also knew that he was involved in a case that had to do with murder, either as a witness or a suspect.